About two years ago, one of the most striking albums I’d heard in a long time slid across my desk in the form of Robyn Ludwick’s Out of These Blues. The narrative I took in reviewing the album was that of Robyn’s artistic triumph in the shadow of her brothers (Bruce and Charlie Robison). Well, more recently, I was confronted with a female artist reaching for the limelight from underneath longer casted shadows than that of the brothers Robison. 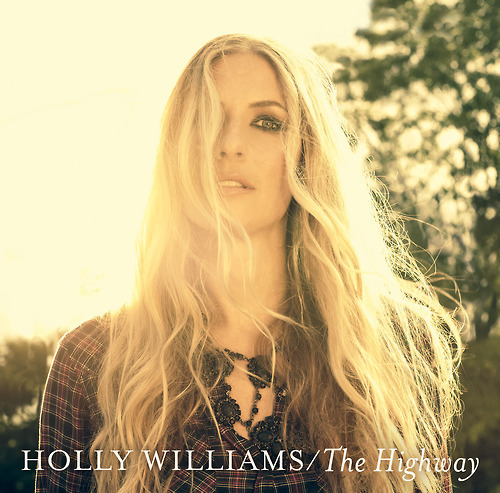 That artist is Holly Williams. Daughter of Bocephus, granddaughter of Hank. Half sister of Hank III. After enduring a major label enslavement, Williams bounced around as a young artist trying to find her voice and displaying glimmers of greatness on two uneven major releases. On The Highway, Williams calls Charlie Peacock of The Civil Wars fame to the producer’s chair and proceeds to unleash eleven tracks of honest, heartbreaking country music with enough Americana flourishes to remain hip. bring to mind Evan Felker’s finest work with lines like “I never knew I’d be the boy who your mama warned you about…” but with a lot more emotional weight within the context of the song. And, if somebody’s released a better heartbroken song than “Happy” in 2013, I’ve yet to hear it. The aching with which Williams emotes the title track reminds of the best work from Will Hoge. A non-cliche’d look at a musician’s life on the road, this is the type of song that used to make country radio unique before it turned into a rural infomercial of bad stereotypes. The album closes with the gutwrenchingly bittersweet “Waiting on June”, the tale of a loving couple that has evolved from young, passionate lovers to sleeping in different single beds at the nursing home. This entire album is brutally honest and absolutely beautiful. The Highway isn’t simply an Americana record, certainly not a Texas record, sadly couldn’t even be referred to as country by most modern definitions…but the one label it deserves is brilliant. Probably the most personal and well executed country album in years. A real jewel. Holly’s voice is a language as itself. put up higher! Come on over and discuss with my site . I simply want to say I am just beginner to blogging and site-building and absolutely enjoyed this web site. Almost certainly I’m going to bookmark your site . You absolutely have amazing posts. Many thanks for sharing with us your website. You sound so passionate about what you are writing. Keep up the good work! We’re a group of volunteers and starting a new scheme in our community. Your site provided us with valuable info to work on. You’ve done an impressive job and our whole community will be grateful to you. I’m still learning from you, while I’m improving myself. I absolutely liked reading everything that is posted on your website.Keep the stories coming. I loved it! I do not even know how I ended up here, but I thought this post was good. I do not know who you are but definitely you’re going to a famous blogger if you aren’t already ;) Cheers! It is extremely hard to discover points nowadays. There are just a few internet sites that offer this kind of details bent on the public. I appreciate that our Federal government website offer this info for us. Will you be breaking down anymore information in the future on this subject? Hi there! Quick question that’s entirely off topic. Do you know how to make your site mobile friendly? My weblog looks weird when browsing from my apple iphone. I’m trying to find a template or plugin that might be able to fix this issue. If you have any suggestions, please share. Many thanks! I simply wished to thank you very much once more. I am not sure the things that I would’ve followed in the absence of those advice contributed by you concerning this area of interest. Previously it was a very frightening problem in my opinion, however , seeing this specialised tactic you solved it made me to cry over joy. I am thankful for your work and thus believe you recognize what a great job that you’re providing educating people thru a web site. I know that you haven’t got to know any of us. Magnificent web site. Plenty of helpful information here. I¡¦m sending it to a few friends ans also sharing in delicious. And obviously, thank you in your effort! I’m extremely impressed with your writing skills and also with the layout on your blog. Is this a paid theme or did you customize it yourself? Either way keep up the nice quality writing, it’s rare to see a great blog like this one today..
Well I sincerely enjoyed reading it. This subject provided by you is very useful for correct planning. Previous PostThe Drop Is Back! 'A Concert For Life ', took place at Wembley Stadium as a tribute to Freddie Mercury and for AIDS awareness. Metallica, Extreme, Bob Geldof, U2, Def Leppard, Guns 'n' Roses, George Michael with Queen, Elton John, Annie Lennox and David Bowie all performed in a very historical concert broadcast live by MTV worldwide.